Man spricht Deutsch … the workshop is in the German language; however, it is possible to split the groups when there is enough demand for English. You can book each workshop separately or together as a package. 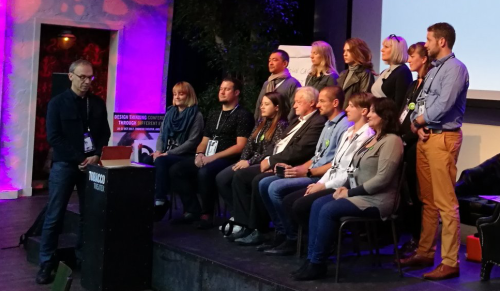 zwei Workshops am 16. und 17. Mai 2019. Beide Workshops können zusammen und auch einzeln gebucht werden. Wie Musikdenken uns helfen kann besser zu kooperieren. Sinnvolles Zusammenarbeiten mit dem Music Thinking Ansatz. Eine neue Sicht auf Kreativität, Kund*innenorientierung und Organisation mit dem Music Thinking Framework. 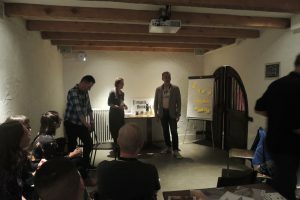 Sie lernen den Music Thinking Denkrahmen (Framework) mit seinen sechs Stichworten (Cues) kennen und arbeiten praktisch mit den Music Thinking Jam Cards und drei neuen Workshoptools, die sie nach dem Training direkt anwenden können. Wer: interessierte Fach- und Führungskräfte, die ihre Organisation auf dem Weg zu mehr Kreativität und Kund*innenorientierung unterstützen wollen. Wie Musikdenken uns hilft Kund*innen und Mitarbeiter*innen mit ihren Bedürfnissen besser zu verstehen, zu visualisieren und sinnvolle Produkt-Services zu initiieren. Service Design Thinking mit dem Music Thinking Ansatz. 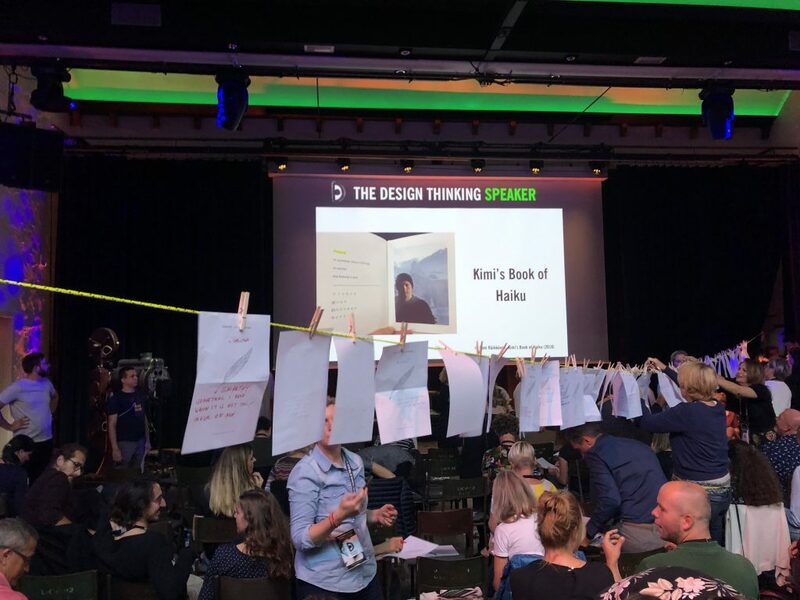 Sie lernen, was die Grundlagen des Service Design sind, wie man die drei Tools Stakeholder Mapping, Persona und Customer Journey sowohl bei der Untersuchung als auch bei der Zukunftsblaupause einsetzt und das alles mit einem ganz neuen Ansatz des Music Thinking, der das Verständnis und den Einsatz einfacher macht für Ihre Kund*innen-, Mitarbeiter*innen- oder Nutzer*innen-Journey. To see limitations as the starting point for creativity is a great skill to develop. Every day we face limitations. And limitations are everywhere. We find mental or physical boundaries of circumstances we might have chosen or not. We depend on beliefs, on schedules, on language, on nature, on the weather, on others, on our helpers, colleagues or family. But we also might experience limitations where others see possibilities. If we want it or not, boundaries help us to focus. To focus on the limited options that are left. So we take them as a starting point to make the best out of it to diverge from our boundaries, develop new ideas and live the mantra ‘less is more’. The essence of the limitations card is how can we de-focus from our experienced horizons and be curious about what else there is. This means take limitations as a start for new choices and divergent thinking to develop new innovations. The picture is a snapshot with my iPhone. 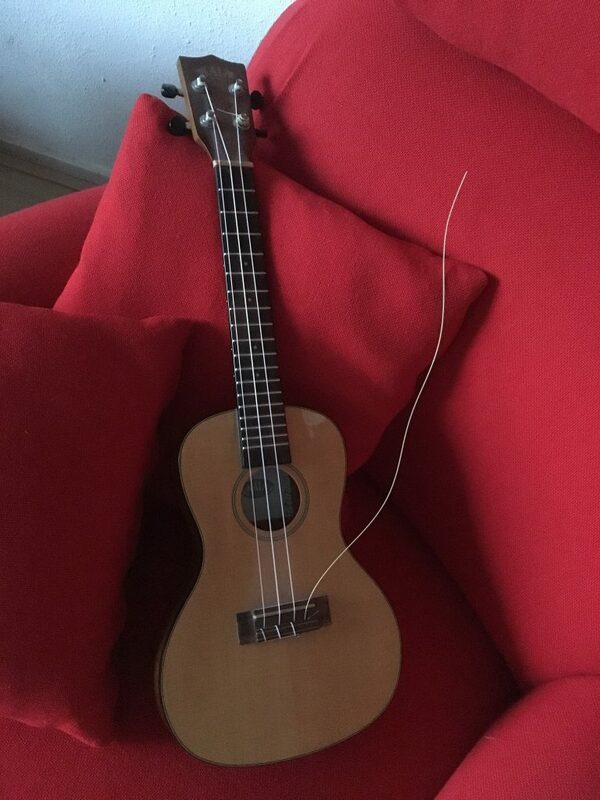 One morning I came down to the living room and saw my Ukulele with a broken string. Besides the fact that I had to fix this, I was charmed by the nice picture. Because the way the a-string was standing in the air with this lovely curve gave me a sense of not just fixing this problem but trying to use it as it is. I played half an hour with only three strings and it struck me how easy and convenient it was. My playing was totally different than normal. More simple, like an exercise in focusing. A Plan, And Not Quite Enough Time. I love this quote by Amercain composer and conductor Leonard Bernstein. This is not just about improvising but about focus. To start with a plan that gives you the focus on vision and guidance is essential. The limitation in time to speed up decision making and on the spot creation of choices is the starting point for creativity. The limitations card does not have a musical sample. The Spotify link leads to the spoken words of Leonard Bernstein, a disclaimer before the performance of Brahms c-minor concerto. This is a great example of leadership and followership together. In leading, in this case, the New York Philharmonic and in following, in this case, the ideas of Glenn Gould. So the ‘limitation’ of working together and taking a step back in leading and giving the partner the space to introduce his ideas and bringing this all together is great leader-followership. Please take your time to listen to the introduction and also to the concerto, it is worth it. On this card SCORE, AGILITY and PERSONALITY are interconnected. The SCORE is the plan, in this case, the original composition of Brahms. It is connected with the PERSONALITY of Bernstein and Gould, so interesting it is not one PERSONALITY but in this case two. In AGILITY you have to make decisions, sometimes on the spot. This means before you would REMIX, this would be the performance, AGILITY is making sense of PERSONALITY and SCORE. 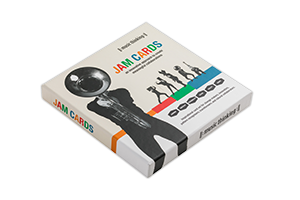 You can order the jam cards via your local bookstore (worldwide) and have a nice chat with the people there and try the cards right away, or just buy them directly at BIS Publishers. Entrainment – what makes a great team? There are many books written about team building. Amazon lists more than 8.000 titles and a quick search on google results in 4.880.000.000 links, as of today. There is one aspect of interacting teams that I find interesting. It is the moment when things come together when we are in sync or in flow (like Mihaly Csikszentmihalyi calls it). I call this entrainment. Entrainment is a difficult word and not used in daily conversation, that’s a pity because it is used in different references: the practice of entraining one’s brainwaves to a desired frequency, the synchronization of organisms to an external rhythm, the alignment of a circadian system’s period and phase to the period and phase of an external rhythm, the process whereby two interacting oscillating systems assume the same period and so on. The essence of the entrainment card is how can we reach entrainment as a duo, trio, or a bigger group. So as a team or organisation we could ask questions like: What does it need from every individual to act as one? To what theme, rhythm or signal can we have entrainment? What are the moments when you recognize that you are in entrainment with others and What behaviour can lead to entrainment? And most of all: How can we encourage or facilitate everyone to do this? 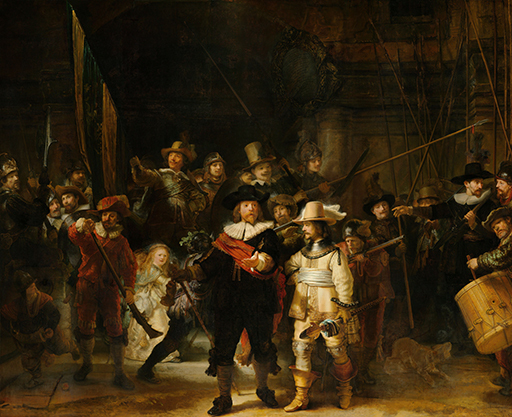 There is so much written about this phenomenal painting, but I want to lead your attention to the right side of the painting, where the drummer is only partly in the picture. 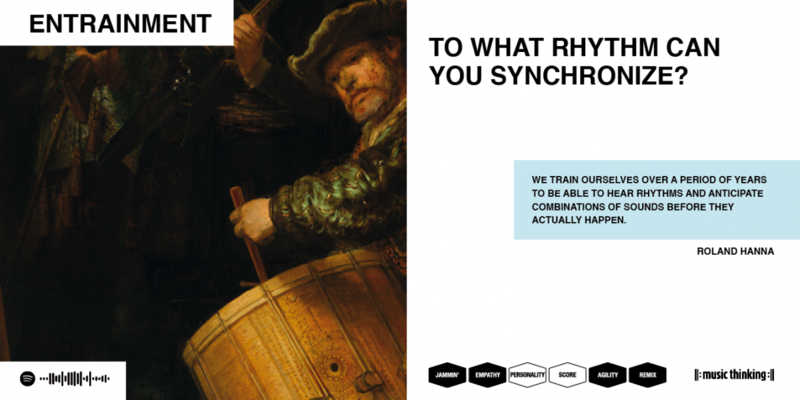 What intrigues me is that he is in total sync with the two protagonists in the middle of the painting and they are in sync of the rhythm from the drummer. You see in the concentration in the face of the drummer that he is focussed in being in sync, helping everyone to come together. And the protagonists hear the rhythm and act upon it. We train ourselves over a period of years to be able to hear rhythms and anticipate combinations of sounds before they actually happen. American jazz pianist Roland Hanna describing an essential capability in improvisation and playing jazz. It is more than just being in sync in playing together like in an orchestra, it is being in sync without knowing beforehand what will come but developing, instant composing, anticipating and co-creating. Poème Symphonique is a composition by György Ligeti for one hundred mechanical metronomes. The piece is written for ten “performers”, each one responsible for ten of the hundred metronomes. The metronomes are set up on the performance platform, and they are then all wound to their maximum extent and set to different speeds. Once they are all fully wound, there is a silence of two to six minutes, depending on the conductor; then, at the conductor’s signal, all of the metronomes are started as simultaneously as possible. The beautiful sound of the different tempi gives the impression of rain. The piece typically ends with just one metronome ticking alone for a few beats. The metronomes are not in entrainment. Here is an experimental video that ‘solves the problem of entrainment with the metronomes on different speed’. Five metronomes are set to 176 bpm and placed on a Foamboard. When empty cans are placed underneath, the board is free to move from side to side and the metronomes are able to influence each other into synchronization. When the cans are removed the metronomes are no longer physically coupled and some of them begin to fall out of step again. The JAMMIN’ cue connects with the EMPATHY cue, this means we have to be creative and also have a feel for the other. We have to sense what the other is doing, needing, wanting and hopefully the other is doing the same. This means entrainment is not only done by one person, but it also needs at least two or more. If this works together we have the base for AGILITY, because like Roland Hanna is saying there is anticipation ‘before it really happens’. The REMIX is the result that shows this meaningful interaction. 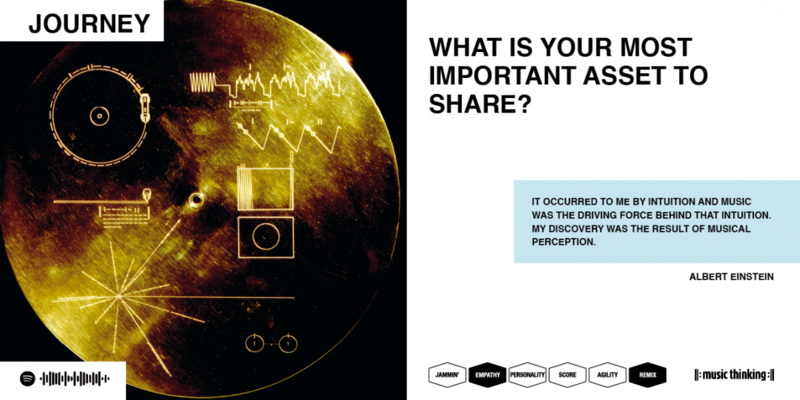 Journey, what is your most important asset to share? When we talk about moonshots or moonshot projects we talk about something far away but principally, with some effort reachable. In a technology context, it is an ambitious, exploratory and ground-breaking project undertaken often without any expectation of near-term profitability or benefit and also, perhaps, without a full investigation of potential risks and benefits. We face the unexpected, the unknown and hope for the best. The essence of the Journey card is to think about what our most important assets are. It means, what is the most important asset that we have to keep when we are going on a journey. This is important when you think about a space mission, but also when we think about our products and services, our companies communication, brand message and the values we want to share with our stakeholders. Stakeholders we know now, but also potential stakeholders of the future. 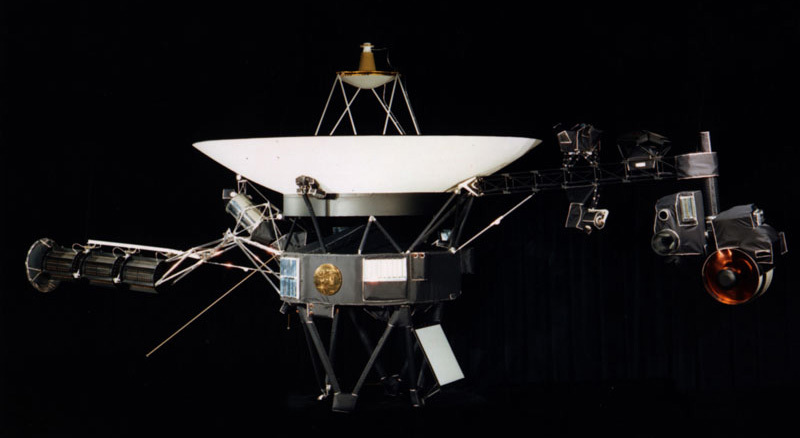 In 1977, NASA launched two spacecraft on a grand tour of the solar system and into the mysteries of interstellar space. Attached to each of these probes is a golden phonograph record containing pictures and sounds as a message for extraterrestrial intelligence that might encounter it. Each record is encased in a protective aluminium jacket, together with a cartridge and a needle. Instructions, in symbolic language, explain the origin of the spacecraft and indicate how the record is to be played. So from a service design perspective, NASA has given instructions for extraterrestrials how to use this record. That is a great job and you should have a look on the website if you would be capable in understanding these instructions. The idea of the golden record was to send the most essential probes of our culture into space, so that extraterrestrials would understand our nature, wow! So the record has been featured in several works of science fiction. In the 1984 film “Starman,” a race of aliens discovers the record and sends an emissary to Earth to learn more about our planet. ﻿ There is a funny or better interesting story about all the songs and musical piece Dr Carl Sagan has selected. The record contains music from African tribes, Johann Sebastian Bach, Beethoven, Mozart, Japanese Shakuhachi, Indian Raga and Johnny B. Goode from Chuck Berry. Remember we are still in the middle of the cold war, Europe is threatened by the soviet union and Nato is making plans for missiles in West-Germany. This was the time when NASA gave the assignment to a committee led by Carl Sagan to curate the 90 minutes. High-ranking Soviet politicians did everything they could to get the popular Russian song “Moscow Nights” (Podmoskovniye Vechera) included into the project. Alan Lomax, a legendary American folklorist, was asked for advice. He instantly discarded the Russian song and adviced them to include the Georgian song ‘Chakrulo’ instead. So this is the most famous Georgian Song and there is no Russian Song on the record. Funny enough Lomax opposed to including Johnny B. Goode because it was ‘adolescent’. And this time Sagan’s brilliant response was, ‘There are a lot of adolescents on the planet’. Albert Einstein, who could play the piano and was a formidable violinist, talking about the driving force of intuition. It is said that when Einstein was thinking about a problem and got stuck, that he then stopped working and started playing the violin. And after playing for a while he moved back to his work with a fresh idea or the solution to the problem. So there is a direct line between, making music, intuition and problem-solving. We need EMPATHY to connect with the other, we have to imagine what they look like, what they think and feel. This is tremendously difficult when we talk about someone or something that we have never seen before. We have to think about how they will look to us, how will they interpret our objects, our looks our behaviour. The most important thing is that we take the best we have, or what we can get, collect it, combine it, synthesize it, in other words, make the best REMIX and ship it. There might be an extra cue that could come into play PERSONALITY: If we don’t exactly know how we can have EMPATHY because we don’t know the other side, have not enough data, information or narratives; we have to focus on what we are, what makes us human (a company, yourself) and try to communicate this as clear as possible. So the cue PERSONALITY can come into play when we are not sure about the outside world because we first have to be sure about who we are. 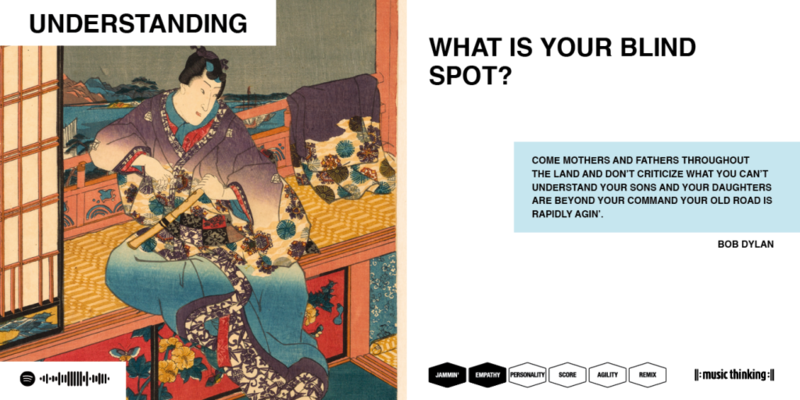 Creativity, or how can we waltz with complexity? There are many books written about creativity and creativity is not just a skill or a magic wand that helps us when we are desperately looking for solutions for big problems. There are many ways of being creative, and this can be in small and simple but also in complicated or even complex situations. There is a big difference between complicated and complex. For the former, it might help to reduce the complicated elements in smaller simpler units (like it is done in agile development), for the latter that is not possible. It needs a different way of creativity. There is no simple solution to a complex problem. Instead of looking for the next simple quick fix for something that is nearby, we should think about how to understand the complexity, what level of complexity do we experience and how is the complexity changing. This means complexity is not a problem to be solved but a system you can only understand when you are a part of the system and try to change it. This needs creativity in many dimensions and many senses. It’s like dancing the waltz with a complex system, having fun in mutual changing development instead of analyzing and trying to fix it. So have fun with complexity, embrace the paradox. This is a snapshot I did with my iPhone on a Vintage Guitar Show in the Netherlands. Besides many guitars from decent to crazy, there are also many accessories to tune, maintain or enhance your guitar, amp or yourself. One of these is the Gizmotron. 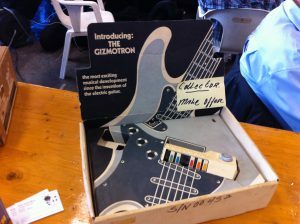 The Gizmotron, is an effects device for the electric guitar. It was invented in 1969 and patented by the English rock musicians Kevin Godley and Lol Creme in 1975, whilst they were members of the British rock group 10cc. Taped or permanently attached to the body of an instrument, the Gizmotron uses small, motor-driven plastic/rubber wheels to make the strings vibrate, yielding resonant, synthesizer-like sounds from each string. Plagued with design and manufacturing problems, the Gizmotron did not live up to expectations and was a commercial failure. In this regard, it became a collector’s item. Creativity is more than just being different. Anybody can play weird – that’s easy. What’s hard is to be as simple as Bach. Making the simple complicated is commonplace – making the complicated simple, awesomely simple – that’s creativity. This is a great quote from Charlie Mingus, a great musician and bass player. He understands that creativity is not just a single trick (being weird or different) but part of a bigger system and Johann Sebastian Bach is a great example. It also shows that Mingus is looking far more than his Jazz experience to the area of classical or baroque music. That Mingus was an inventive innovator with a broad view not only in music can be seen in the inspirational links below, he was also a cat lover. ﻿ The Brandenburg Concertos by Johann Sebastian Bach (BWV 1046–1051, original title: Six Concerts à plusieurs instruments) are a collection of six instrumental works presented by Bach to Christian Ludwig, Margrave of Brandenburg-Schwedt in 1721. They are widely regarded as some of the best orchestral compositions of the Baroque era. Bach used the “widest spectrum of orchestral instruments … in daring combinations,” as Christoph Wolff has commented. Here is a side story: when my daughters were young, I made for them mixtapes with the most different musical pieces. From classical to Punk, Jazz, Rock or Pop to instrumental, German, Italian and English songs. Among others, there was also the excerpt of the Brandenburgische Konzerte you hear above. My eldest daughter walked daily with a cassette recorder through our apartment. One day when we had guests and were sitting on the table, she entered the room with her recorder, put it on the table and was explaining: ‘and this is Bach’, then she left the room and an astonishing group of people thinking about the well educated and musically talented little girl. SCORE, JAMMIN’ and REMIX are three cues that connect with complexity. They live in the solution space and have the potential to quickly prototype and iterate new possibilities. JAMMIN” with the power to invent, listen and create, SCORE with the power of visualising the outcome or documenting the hypothesis and REMIX as the master of shipping, of creating something of value to use or perform. See here: how the cues connect with the Music Thinking Framework. Everybody knows this or at least was in a situation where you got stuck into something. Especially when we are in a new position or new environment we sometimes feel limited and have the feeling to avoid making missteps or mistakes. Or when the possibilities, limitations, rules, or urgent things to do give us an overload of data and as a matter of fact no energy to move. Sometimes action speaks louder then words and the basic idea is to keep playing instead of stopping to talk. There are two lines of thoughts here. One is about getting in action without too much holdback from anything and the other is how can we develop if we don’t make mistakes. An exercise to the former could be to focus on ‘what is not the problem’ or asking yourself or your team ‘what is the emerging energy or strength in the room where you all can work with’. To the latter, just take any action even if it feels like a mistake and see it as a pivot point to change directions or a learning experience to get better. This is a picture from the streets of Riga. I made this picture while being in Riga for a presentation on the Design Week. 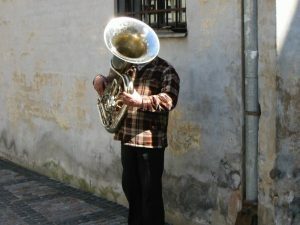 While walking to the streets I heard from a distance the nice sounds of the street musician playing on the tuba, when I finally saw the player I recognized that the instrument completely covered his face. He was not only visually united with his instrument but also playing without any restrictions. This picture for me is also a symbol that when you are prepared and ready you are able without any further planning to get into action. I believe that every one of us has a certain level of readiness to make the next steps. 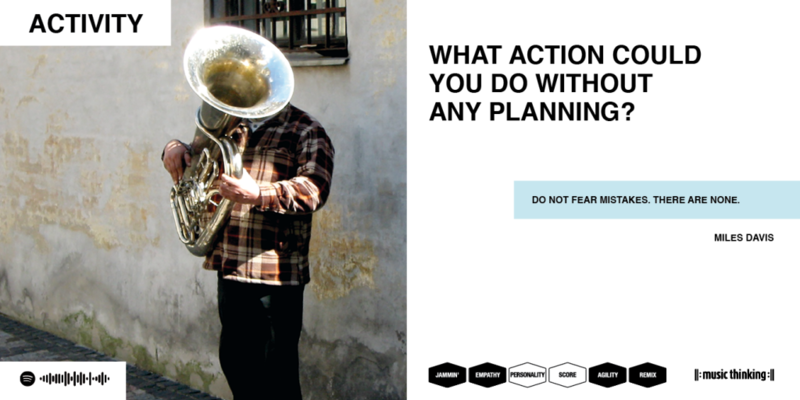 As an organisation, we have to find out what our level of action is. 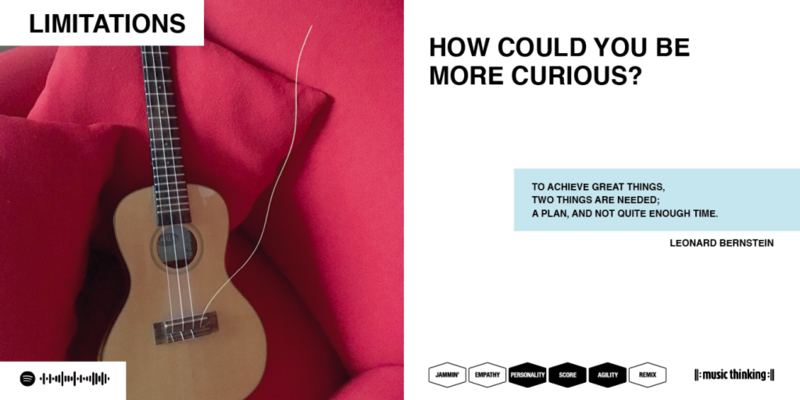 One possibility to find out is to learn an instrument and play (Ever tried the Ukulele?). There are many examples were playing together and not talking can lead to better outcomes then logical thinking and arguing. Miles Davis is one of the biggest inspirations for me. Most of the musicians were talking about Miles as the ‘best listener who ever led a band’, he heard what everybody else was playing and with his voice and the ability to show new possibilities he was the glue to make it sound like a whole band. His instructions were famous in being vague, showing the right direction and also leaving enough freedom for own interpretation. So if you don’t believe that there are any mistakes everything is possible. This is a take-out from one of the most famous recording sessions of the album Kind Of Blue from 1959. We hear the quintet playing. We hear the start of Freddie Freeloader and some noise right before the tape starts, ‘take 1, no title’ so the title was not yet decided. After a few seconds, the recording stopped and we hear Miles ‘It is too fast’, but also the recording engineer that reminds Miles not to move away from the microphone. Freddie Freeloader is one of the most played jazz standards in the world and it is very charming to hear how this great recording started – with a mistake. This card is connected with JAMMIN’, the power to take what you have and bring it to the table or rehearsal room. It also contains the unlearning factor, the question what do we have to unlearn if we are stuck. EMPATHY helps us to see that making mistakes makes us human and that it’s not a big deal to make mistakes or commit that you have made some and encourage others to try and get into action. This is also the precondition of AGILITY because you can never be agile when there is a lot holding you back while performing. So REMIX is the performance of the best you can do now. See Music Thinking Framework for an explanation of the cues. An inspirational card set for change makers, pattern recognisers, innovators, transformers and natural collaborators. The Jam Cards consist of 38 inspiration cards and six cue cards. 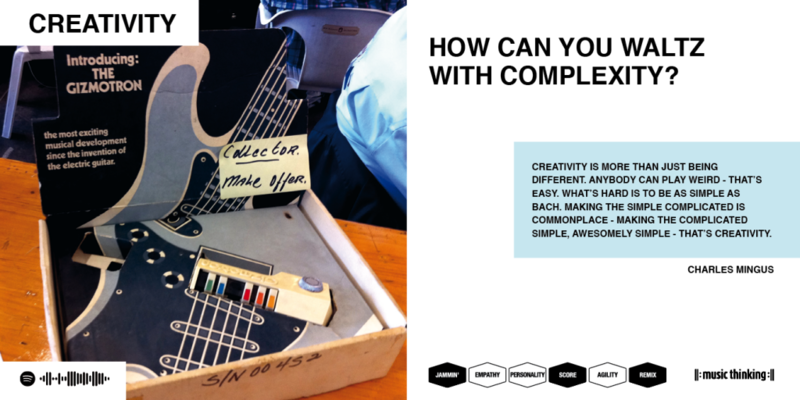 All inspiration cards have a keyword, a visual and a sonic trigger, a trigger question, an inspirational quote, and six cues that connect with the Music Thinking Framework. You can use the cards from a strategic point of view, knowing what you want or need and a serendipity approach open for everything that will happen. ‘Music Thinking’ lets people work and play together in a new way with inspirations from the rich world of music. Vision, mission, goals, targets, why, how and what are inevitable words in the business vocabulary. We spend time and money to find out who we are, how we can grow our business and the way that leads us to big hairy audacious goals. And from time to time we change this because we encounter new possibilities or constraints. But what about the things that help us shape this bright future? What about the means, the tools, the instruments we are using to reach what we want? With tools I mean a vast field of artefacts that could be for example the Stradivarius of a violinist, the Selmer Mark VI Saxophone of a jazz player, the self-made tools of a Japanese joiner, your favourite whiteboard marker, your MacBook Pro, or the online tool you use for customer journey mapping. So, how does this resonate with you? Are we using the right tools? And are we using them in the right way? Are there useful tools we don’t know, old or new? What are tools anyway? In what way might tools influence our thinking, our behaviour and eventually our success? 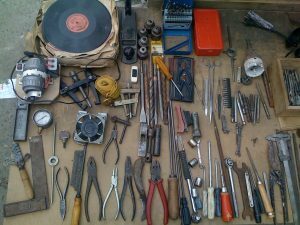 Think about the tools, instruments and tooling you use every day as a person and/or a company. What does this say about you? 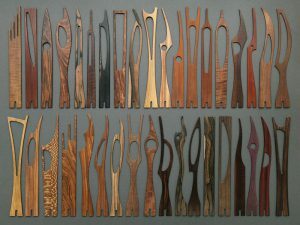 How do you maintain the tools? How do you choose them? Which one do you throw away after use? And which are a companion through your (business) life? You might use these questions and the ‘Tools Card’ as a discussion starter with your colleagues, family members or just with yourself. One of the advantages of a musician is the time you can spend between rehearsals, meet-ups and concerts. It is the quality time when you can de-focus, explore the neighbourhood, kill some hours and be open for serendipity. One of these moments brought me to a market in the Russian city of Krasnodar, it was at the beginning of the 90s while travelling with the improvisation group Raum-Musik for Saxophone. In the open, there was a huge flea market, with very diverse offerings. It was the first time that I realised that there is a demand for single shoes. So if your left shoe is broken or lost, you don’t buy a pair of new ones but just a replacement. This was not only one stand that offered single items, but it was also a characteristic pattern of singularity. Looking for patterns I was on the outlook to find unseen things. This finally brought me to the stand where the offering was a set of second-hand tools like screwdrivers, Phillips screwdrivers, drills, a computer ventilator, electro-motor and a pile of records. Wait a minute, a pile of records? I tried to make connections between all the items and they made more or less sense as most of them were tools. So I thought about the relationship with the pile of vinyl records. 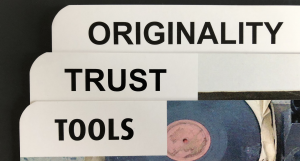 How could a record, or better music be a tool to fix something? It was this moment that sent me on the track of Music Thinking and how music could be of any help or use. I see myself as a tool maker, as someone who manufactures hammers and nails, without knowing what those hammers and nails will build. 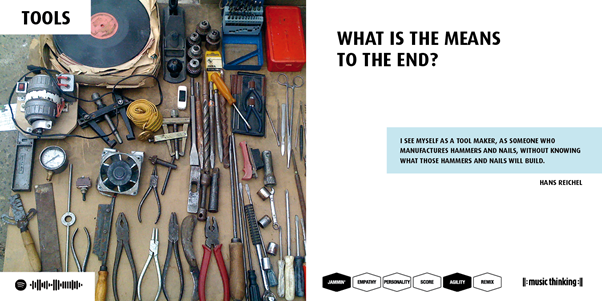 Thinking about tools and music, I eventually came across the quote of Hans Reichel. He was a musician, inventor, luthier and designer. 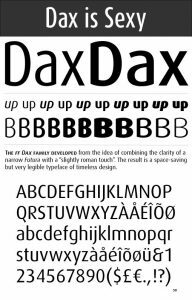 He is the inventor of the daxophone and the dax typeface. The commonalities are the shape. I am fascinated by his inventions and design, and especially I like that he used the same principle to design an instrument (the dax you are holding in your hand to change the pitch) and the basic shape of the typeface. For me, this is music thinking par excellence. In Harmony with Henry the Horse on Lower Lurum by Hans Reichel. I encountered this music many years ago and fell in love with the sound, but the real shock or nice surprise came when I saw the beautiful tongues he invented and the way how the instrument is played. I had the chance to later make a daxophone of my own in a workshop led by inventor and musician Yuri Landman. There are six cues in the music thinking framework. My first thought is that if we want to do some JAMMIN’, we need something, a tool. And you can only work in an agile way when you know your instruments and how to use them, even more, when you have to work together with others. Note: There is no direct line between JAMMIN’ and AGILITY on the framework, it needs PERSONALITY (the right tool according to why and how we operate) and SCORE the right thing that fits to what makes sense (JAMMIN’ and EMPATHY). The Tool Card is unique in the Jam Card set in the way that this is the only card that uses a different typeface then all the other cards. All the cards use Helvetica, but the Tools card is using the typeface Dax. This card is a homage to Hans Reichel, and his versatility as luthier, musician and font designer. 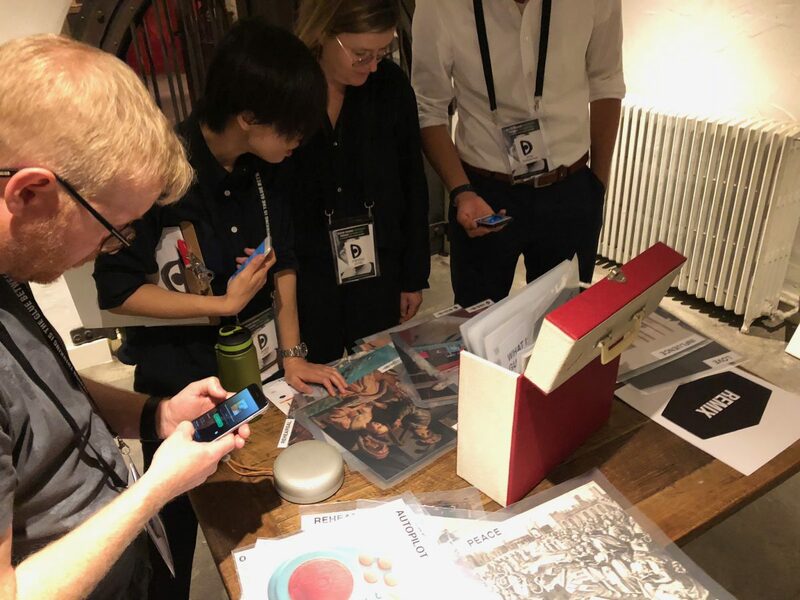 We did a music thinking workshop breakout on Friday 12th October at this year’s Design Thinking Conference in Amsterdam. Like last year, the conference had the subtitle ‘through different eyes‘ and the focus on empathy. 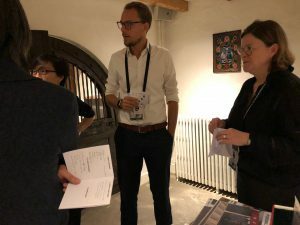 Instead of definitions, tools and showcases, the conference focused on inspirations to question oneself, debates getting further, perspectives outside the comfort zones, all in togetherness and positivism, and with a bit of lightness. For more info about the conference see the facebook page. Because Empathy is one of the six cues of music thinking we extended the theme to “through different ears” because music thinking starts with listening. We started our one-hour session with a very short explanation of the Music Thinking Framework and the new Music Thinking Approach to Service Design overview. We divided the hour into the four sections Listen, Tune, Play and Perform of the framework. Empathy is the cue to change. It starts with listening. We did three listening exercises: We started with Wide Listening, the awareness of sounds surrounding us (a link with John Cage and Pauline Oliveros). Then we did Close Listening, the exploration of a very near object (this is inspired by Terry Riley). The first two exercises were very short and after the exercises, the participants had to write down what they heard and what they thought. 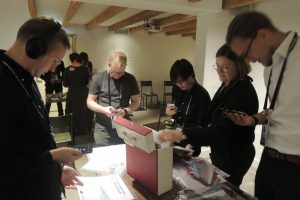 For the third exercise, we used the Jam Cards in Serendipity Lab mode, the participants used their smartphone to play the spotify codes that are on every card. After the Listen phase, everybody stepped into the Tune phase and was looking for patterns, insights and surprises. Before the Play phase, we did the team grouping in duo, trio, quartet and quintet. The groups prepared each other for the 1-minute performances. 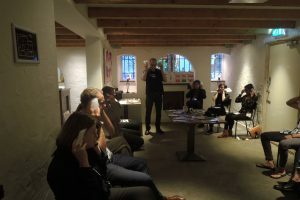 If you are interested in the last year’s workshop you can read more about it on the CREATIVE COMPANION blog and also hear a recording of the performance of the workshop group of John Cages 4’33’.